Yvonne Andrau - meherbabatravels jimdo page! 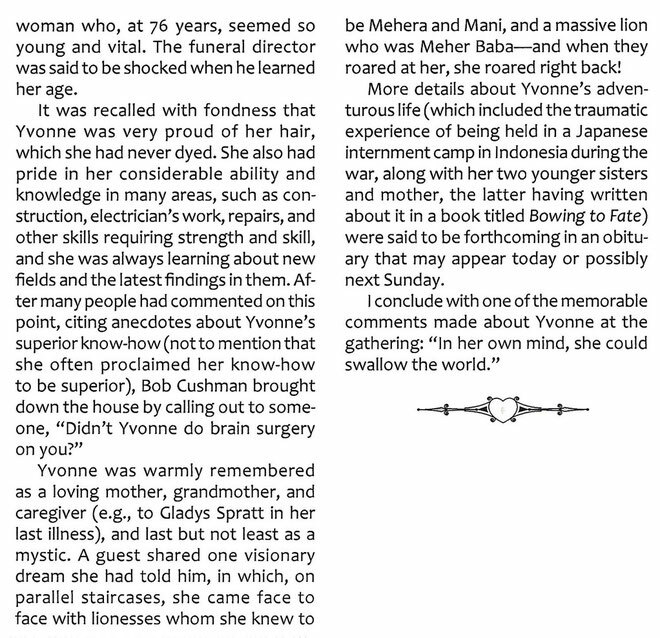 «two of the three girls in the cover picture [see amazon link below] are Baba-lovers, and the one on the right met Meher Baba, and corresponded with Him and the Mandali for many years, and was instrumental in bringing Lyn and Phyllis Ott to Meher Baba and to their living on the Center (Yvonne is the Otts' Baba-contact). «At least for these two sisters, this early time of their life began their journey to connecting with the Avatar. The family was European, and followed a petroleum engineer/project manager's life in different countries of Europe and the Far East. 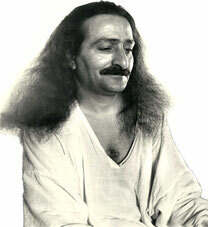 It is unlikely there would have been much opportunity for these oil-industry Europeans to have contact with Meher Baba or his "fellowers" on all-Indian darshan tours. «The book details example after example of people making decisions, and the best of humanity - the courage and integrity possible under adversity. The seemingly random or incomprehensible series of events in our lives cannot be understood for their full importance and meaning in isolation; stories of personal journey illumine the ever more mysterious ways of God, and His love for us, and our larger journey to Him. More than 10,000 women and children. That’s how many civilian prisoners of the Japanese were packed into Tjideng, reportedly the worst Japanese concentration camp in Java during World War II. Among these 10,000 mostly Dutch women and children were Hungarian Klara and her three young daughters. Meanwhile Klara’s Dutch husband, Wim, a captain in the Royal Dutch Air Force, was among the 1500 military men crammed into a hell ship and transported to Japan as a slave laborer. 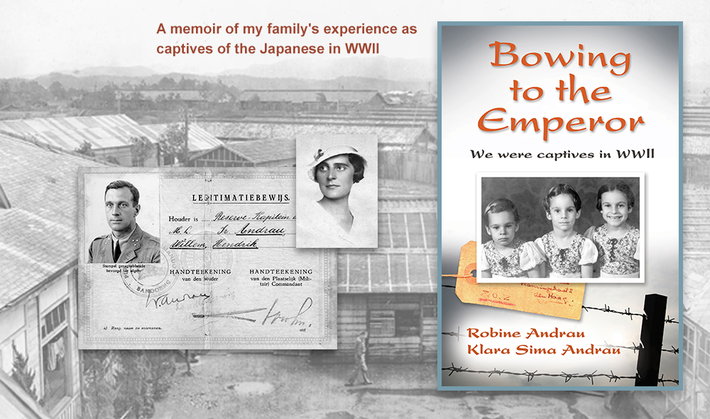 "Bowing to the Emperor: We Were Captives in WWII," a memoir/biography penned by Klara and daughter Robine, chronicles the Andrau family’s experience during those dark years in the then-Dutch East Indies (now Indonesia) and in Japan. The story reveals the fierce determination and ingenuity of a mother and the strength and leadership of a father when faced with starvation, brutality, and unspeakable living conditions. Klara’s part of the story details what she did to keep the couple’s three children and herself alive and well in body and mind, both during the Japanese occupation in 1942 and during the children’s and her subsequent internment. Left with no income after Wim was taken away, Klara scraped along by giving language lessons, teaching the three R’s to classes of children, and making and selling jams. Later, when interned in camp, she supplemented their daily diet of a handful of rice, a little piece of gummy bread, and a few leaves of a spinach-like plant by digging up the packed earth and planting some leafy vegetables, which she fertilized with night soil. She also pawed through the camp kitchen garbage looking for anything edible and knit socks for the Japanese to earn some sweets for her children. She kept the wonder of Christmas alive one year by stealthily evading the patrolling Japanese guard in the predawn darkness, climbing a fir tree next to the barbed wire and bamboo camp fence, and sawing off the tree’s top with a toy saw. When decorated with a few candles, the top was transformed into the most magical of Christmas trees. Wim’s story centers on his role as the senior officer in charge of 400 Dutch and later an additional 200 American and 2 British POWs in camp Fukuoka #7 in the Japanese coal-mining town of Futase. He led his men with good humor and optimism and negotiated tirelessly with the Japanese commander, sometimes successfully, for shorter work hours in the coal mines (from 12-to-14-hour days to 10-to-12-hour days), for more rest and recreation time (from a partial to a full day “off” every ten days), and for more food. Beatings on the part of the Japanese guards were a perennial problem. By bypassing the Japanese commander and slipping a list of brutality complaints among other suggestions for changes into the hands of the visiting Swedish consul, Wim succeeded in marginally improving the situation for his men. His greatest success, however, was in maintaining order and discipline among the prisoners, reducing friction and increasing understanding between the two main national groups, and building morale despite the dirt, near-starvation rations, disease, brutality, and horrendous work and living conditions in the damp dangerous coal mines and the flea- and lice-infested barracks. Besides being the personal story of a family, “Bowing to the Emperor” is also a universal story of survival and of hope despite loss of country and loss of all material possessions. When WWII reached the then-Dutch East Indies (now Indonesia), Robine Andrau’s family was trapped there by the invading Japanese military. 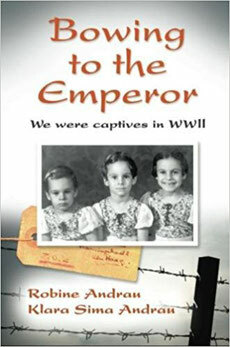 Her Dutch father, Wim, was sent to Japan as a POW and her Hungarian mother, Klara, her two sisters, and she were imprisoned in what was reputed to be the worst concentration camp in Java. After the war she and her family came to America, hopping around a bit until they settled in Woodstock, NY. 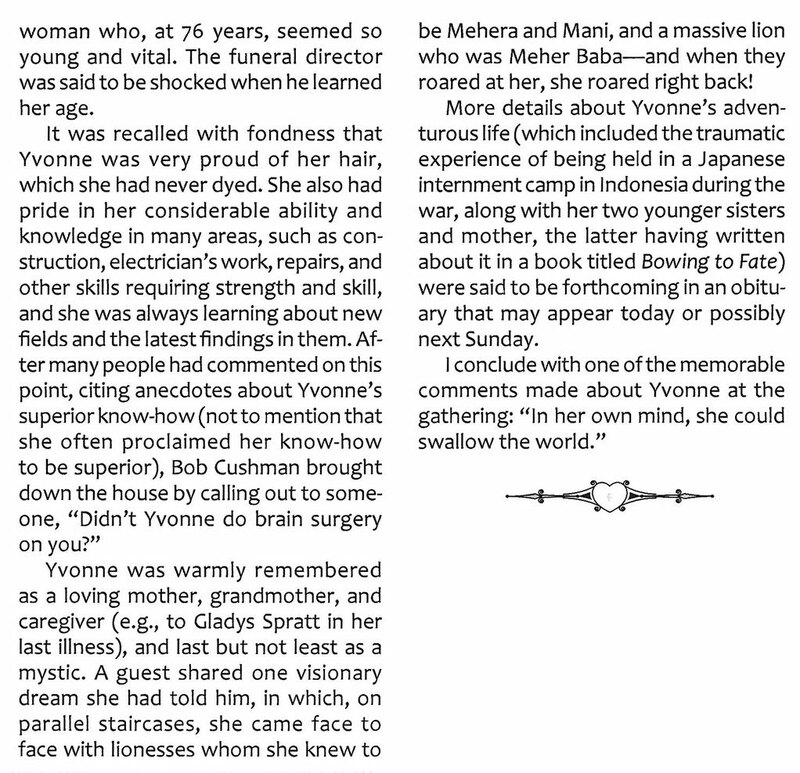 Robine grew up clutching a book in each hand, which led her first to teaching, next to dabble in librarianship, and then to a long career as an editor. After retiring, she began writing in earnest. She now splits her time between promoting "Bowing to the Emperor: We Were Captives in WWII," writing a novel, creating essays for a monthly column in the Scituate Mariner, and submitting personal essays to the Sunday Boston Globe (several published there) and other newspapers and journals. Robine lives in Scituate, MA, near her children and their families, and every day she learns something new about technology from her grandchildren. 5945 "THE ICE IS BROKEN"
I arrived in India in October of 1962, about three weeks before the commencement of the East-West Gathering. 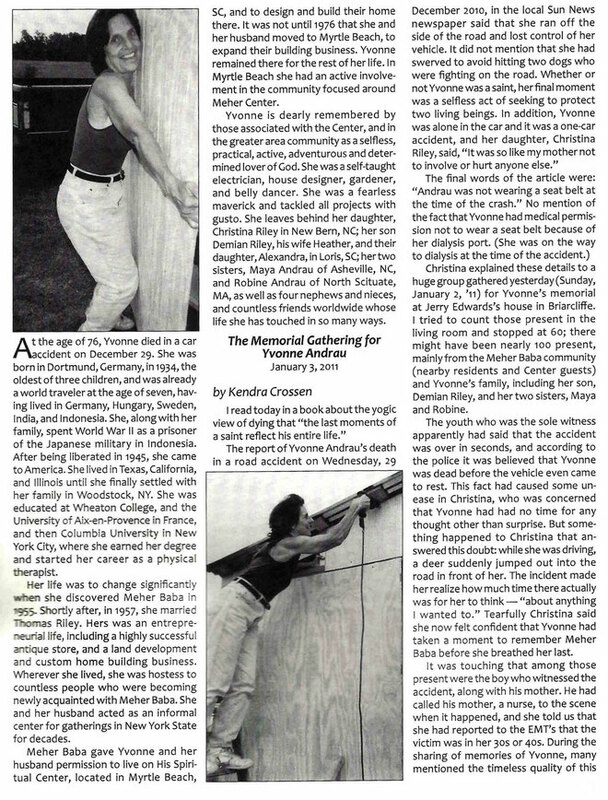 I had come from Woodstock, New York, where I lived with my wife Yvonne and our two children, Christina and Demian. In late September I had taken a ship from New York to Gibraltar and from there, by car to Barcelona, and then, to Bombay by plane. On the morning of October 28th, when Manohar Sakhare was sitting with Baba along with the mandali, Baba suddenly asked him, "What is happening on our borders?" Sakhare answered, "The Chinese are pouring across the Himalayas and are pressing us down the foothills. They will soon be in the plains of Bengal, cutting the army off from Assam." Baba gestured casually, "They will not come down the plains, but will go back." Sakhare was doubtful, thinking a victorious army would never retreat on its own, and India certainly did not have the military strength to push them back. But in the rush of preparations, he forgot about Baba's statement. THE WESTERNERS had been informed not to arrive in Poona before October 28th, but a few came early. 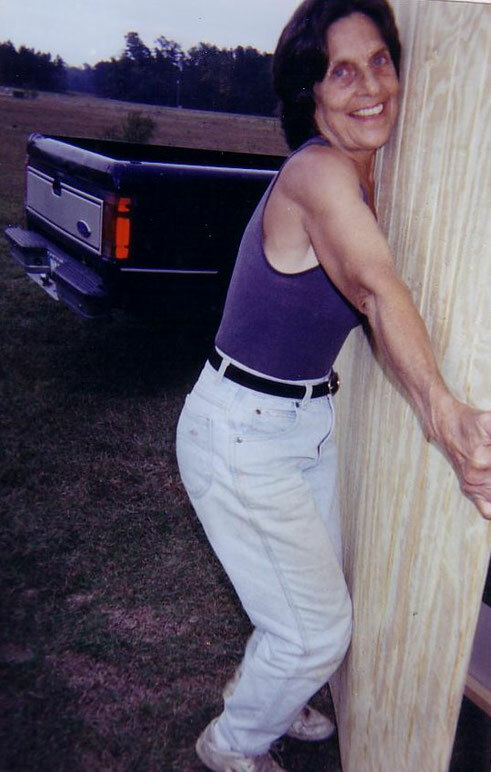 The first to arrive early was an American from Woodstock, New York, named Tom Riley, who had first met Baba four years before at the Myrtle Beach Center with his wife, Yvonne (Andrau). Riley traveled to India by ship and arrived in Poona on October 16th, but by the time he got to India he had practically no money left. He was called to Guruprasad and fell in front of Baba with his head in his lap. Baba remarked to him, "You have no idea how blessed you are today. You have broken the ice for the East-West Gathering." Years later, Tom Riley recounted his experiences in India in 1962.